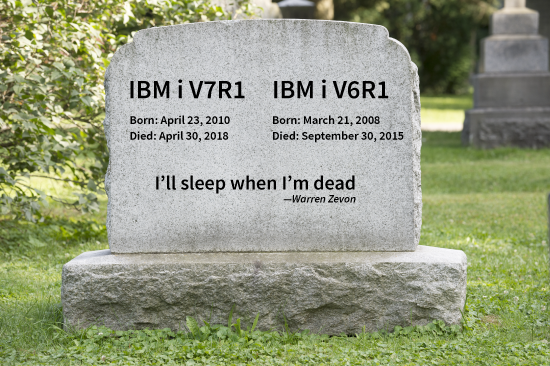 Having lived a long and fruitful life, V7R1 was laid to rest on April 30, 2018. V7R1 died peacefully in its sleep of natural causes. Raised in a large family, V7R1 was preceded in death by several siblings; most recently its younger sister V6R1. V7R1 is survived by two younger siblings, V7R2 and V7R3. V7R1 was laid to rest, next to V6R1, in a box lined with 8" diskettes, as a tribute to past family members. V7R1 served the IBM i community well for the duration of its life. As a foster parent, V7R1 was especially proud of its Technical Refreshes. In its spare time, V7R1 liked to do upgrades and backups, and take the occasional fishing trip. Those who knew V7R1 will miss it and its loyal, faithful compliance to do whatever it was told—right or wrong—99.99999% of the time. V7R1 and V6R1, and all of the other V whatever/R whatevers before them, are dead. Dead like Zed in Pulp Fiction. Dead like Old Yeller. Dead like Luca Brasi. Dead like Bambi's mom. Dead, I tell ya. Dead. V6R1 has been out of support for nearly three years and come April 30th, 2018, V7R1 goes out of support. Yes, there is an extended support plan, but it is expensive and most shops don't have one. Tell your customers, your partners, your other branches, anyone you can, that they need to get to at least V7R2, and preferably V7R3, ASAP. It is quite nearly irresponsible to be running an enterprise computer with a retired operating system. Do the right thing. Upgrade!